WARNING: Never run the engine in a closed or poorly ventilated area any longer than is needed to move your car in or out of the area. The carbon monoxide gas emitted is odorless and can cause serious injury or death. The Starting Procedure: 1. Insert key, and fasten the seat belt. 2. Depress the clutch pedal fully and place the gearshift lever (manual transaxle) in neutral or the selector lever (automatic transaxle) in "P" (park) position. 3. 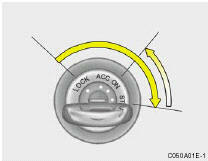 After turning the ignition key to the "ON" position, make certain all warning lights and gauges are functioning properly before starting the engine. WARNING: Be sure that the clutch is fully depressed when starting a manual transaxle vehicle. Your manual transaxle equipped vehicle will not start unless the clutch pedal is fully depressed. WARNING: Always fully depress the brake pedal before and while shifting out of the "P" Park position into another position to avoid inadvertent motion of the vehicle which could injure persons in or around the car.